Over Thanksgiving break, we only have three students on campus in the break home. Everyone else has gone home for Thanksgiving weekend to be with family and relatives. Many parents and guardians came to campus to pick up their children, and stayed for lunch. By the official 2:00 dismissal time, many of our students had started the journey home, since some live as many as five hours away. We were thankful for the sunshine and good weather that allowed for trouble-free travels. The SCJs from the area parishes gathered at the SCJ house on St. Joseph’s campus today for an early Thanksgiving meal. They will be spread out for masses tomorrow, and this was a relaxing time to spend in fellowship, support and story telling. The offices and homes will be closed until Sunday afternoon. Like most things, when you are involved as an active participant, time does pass differently. When people are engaged and lose track of time that’s a good sign. Last Sunday, our boys’ Intercity Basketball League held practice games. Today was the official start of league play as 6th – 8th grade boys from Chamberlain played alongside our St. Joseph’s students. The difference between 6th graders and 8th is noticeable at that age. A 4’9” sixth grader trying to guard a 5’ 10” eighth grader has great odds to overcome. But everyone hustled and kept trying. All the participants got plenty of playing time. Hopefully all will continue to improve their game, and more importantly, build friendships. I made the annual Halloween pilgrimage to the Perky Home (4th-5th grade boys). In the basement, our houseparent Wendy has collected several hundred Halloween costumes over the years – store bought and homemade, scary, funny and whimsical. When I arrived, the Raphael boys (1st – 3rd graders) had just finished picking out what they will wear, and excitedly showed their costumes off. I found some Fred Flintstone clothes on the rack that I’ll try while passing out treats on Wednesday. Over the weekend many of the homes finished up their efforts to win the decoration contest for each age group. About 25 of our staff, from all different areas of campus sat together in the Assembly room to evaluate our 36th annual powwow. Kathleen, our principal led the discussion, and passed out Kudos candy bars, two to each participant. She told us to enjoy one treat for ourselves, and suggested we pass the other on to another staff member, since everyone pulled together so well to make for a delightful weekend. Daily progress is being made on the William Home remodeling process. Today, our maintenance crew drilled into a section of concrete wall almost two feet thick, pulled a chain through and pulled it down. The thud reverberated like an earthquake throughout the Benedictine homes. One houseparent napping before the kids came back from school said he didn’t know what to make of it as it woke him from his sleep. But it opens a new hallway so we can expand the size of the home by the end of the year. During our community adoration, I noticed the wicker basket with the donor prayer requests left from powwow weekend. I used the quiet time to go through them one by one, and lift up the intentions presented in prayer. Many were heavenly appeals for healing from personal illness, but even more were concerns for loved ones going through personal struggles. Fr. Anthony will pass those around to the homes and classrooms and our Lakota students will be remembering those people in prayer. All the Sheehy Home (high school boys) were away at school, but we had a big potluck lunch there anyway. 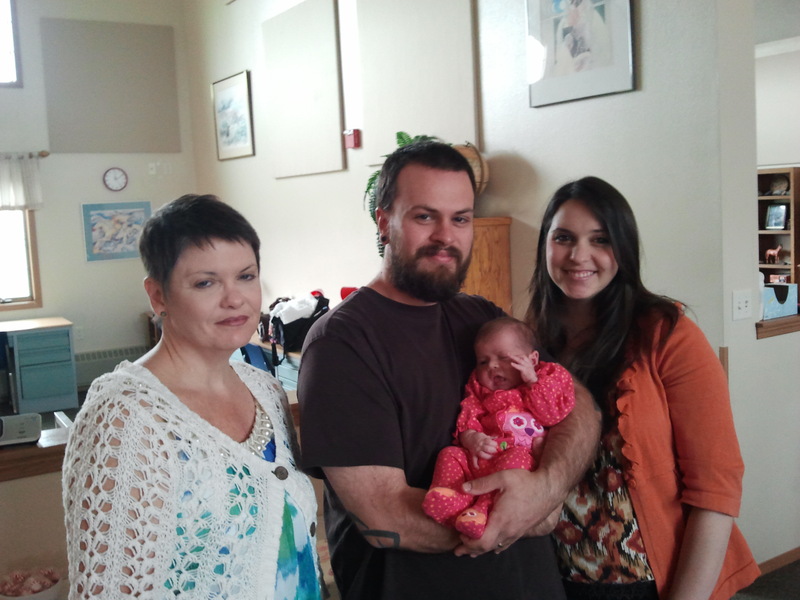 Guest of honor was newborn Lilya, and her parents Tim and Jessica, who began recently as houseparents there. Several of our younger houseparents raise their own children along with the St. Joseph’s students in their care. Most of the high school houseparents were able to visit in a relaxed way, with good food and a festive, joyful atmosphere. 5th graders get to experience a hands on special Science module called Star Base. 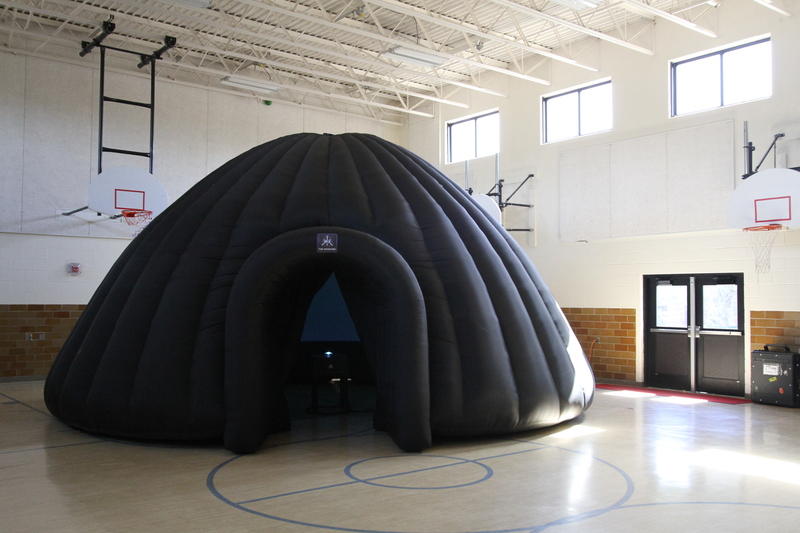 Today the school gym housed a large black inflatable theater in the round, called a GeoDome. While the students lay on the floor, they gazed up at projections of the stars, galaxy and universe. They participated quite intently and excitedly. The kids has a great time learning about the stars, galaxy and universe!